Detail of Sandro Botticelli 'Madonna of the Book' (1483) Museo Poldi Pezzoli, Milan. Dr Annalisa Zanni, director of the Poldi Pezzoli Museum, Milan, will present a Sydney Ideas lecture tonight. During the 19th century Botticelli was rediscovered in Italy and England. In Italy this happened not only because of the extraordinary beauty of his painting, but also because it could represent a kind of national art in which recently united Italians of the Risorgimento could identify themselves. Botticelli's admirers included Gian Giacomo Poldi Pezzoli, who left his apartment and private collection as a museum for public use and benefit. 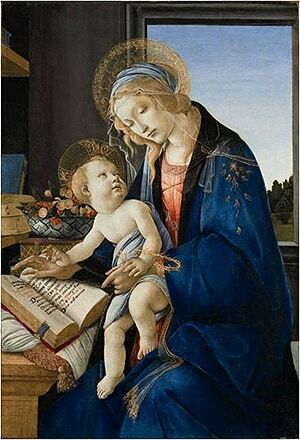 In this Sydney Ideas talk the current Poldi Pezzoli Museum director, Dr Annalisa Zanni, will outline her recent discoveries regarding Botticelli's use of materials and technique, such as those used in his Madonna of the Book. She notes, for example, that in the final layer of this work he used only lapis lazuli for the blue sections - a very precious and very expensive ingredient, indicating it was commissioned by a highly prestigious patron. Professor Mark Ledbury, Director of the Power Institute at the University of Sydney, said Dr Zanni is an authority in both Renaissance art and the whole "question of why people collect. "She will give us a new insight not only into Botticelli's technique and his world, but also the world of 19th century collectors who competed to own and preserve paintings of such extraordinary beauty." Annalisa Zanni graduated in art history from the Università Statale, Milan, and undertook postgraduate studies in medieval and modern art history at the University of Florence. She has been working for more than thirty years at the Poldi Pezzoli Museum, Milan, beginning as a curator and later becoming director. She has created many exhibitions, written books on Renaissance painting, Renaissance jewellery and the history of taste in 19th century, furniture, furnishings, jewellery as well as contributing many essays to the catalogues of the museum's exhibitions. In 2011 she received the honour known as the Ambrogino d'oro for her role devoted to Milan's culture. Co-presented with the Power Institute. Cost: Free and open to all with no ticket or booking required. Seating is unreserved and entry is on a first come, first served basis.